Think back, if you will, to the last time you ate a birthday cake. Don't you remember griping about how it didn't really do anything? Well, Disney's looking to fix all that with interactive cakes. Yes, birthday cakes with pico-projectors. The system would be capable of detecting the topography of a cake which essentially means that if a slice were to be cut out, it could detect the missing piece and respond appropriately. For example, cut out a slice where there's a simulated lake and you may instantly create a waterfall in which water is now represented as flowing down the sides of the new missing cake portion. 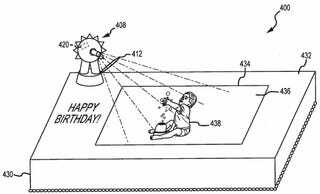 Additionally, props and specially coded utensils could trigger events such as Tinker Bell flying around the cake and leaving a trail of pixie dust when someone waves a wand in front of the cake. Perhaps Captain Hook would instantly appear and draw his sword, preparing for battle, as someone approaches the cake with a knife.